When I was a little kid, probably only five or six as I was just beginning to be ready to sleep over at a friend’s house (and for sure there were some midnight calls home to my parents to come get me), the prospect of a sleepover with my best friend and next door neighbor Bethany was pretty much the most exciting thing I could think of. Whenever Beth or I would come up with the plan to have another sleepover, the very idea of it was so thrilling it was almost too painfully awesome to contemplate (even though we spent almost every day together and lived about 40 yards away from each other). But sometimes our parents said no, for reasons incomprehensible to our kindergarten minds. Then, the disappointment was too devastating to bear (even though we spent almost every day together etc). So I came up with a plan: we would always just assume the answer was going to be no and start feeling sad about it before we even asked our parents. That way if they said yes, we’d be super happy, and if they said no, we’d feel pretty much the same. I felt that this plan was BRILLIANT. It’s etched so vividly in my mind as a stroke of utter genius that I can even remember exactly where I was standing when I revealed my amazing idea to Bethany – right on the border between our yards, near the tree that was shaped like a W.
As a Sleepover Disappointment Coping Strategy, it was pretty decent, but as an approach to life in general, I’ve got to tell you, it’s pretty lousy. All too often in my life I have followed this protocol of protecting myself from disappointment, rejection, and failure by assuming things are not going to work out. I am probably in the running for an Olympic gold medal in Emotionally Dealing With Bad Things That Haven’t Even Happened Yet. Focus too much on what will go wrong, and eventually you don’t try so much. Don’t try so hard. Don’t dare. What does all of this have to do with creativity? Well, it all comes down to fear. Fear of failure is something that lots of people deal with, probably all people at some point in life. I think fear of risk is something slightly different, and it’s even worse. Fear of failure means being afraid of the moment you crash to the ground. Fear of risk means being afraid to even leap. It’s a fear of being vulnerable at all. 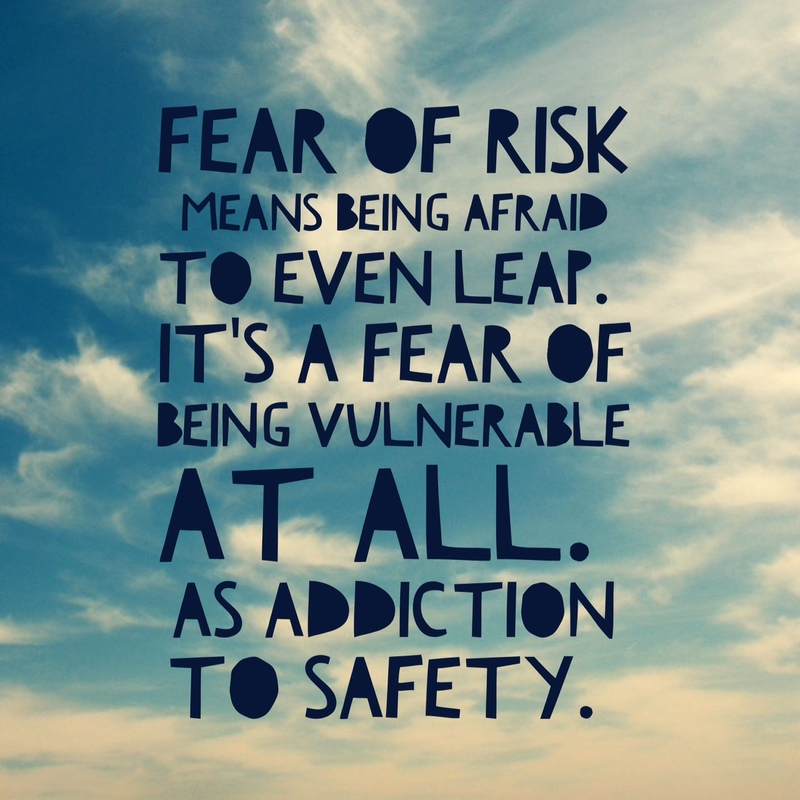 An addiction to safety. Unfortunately for safety junkies like me, being creative is ALL ABOUT being vulnerable. It’s taking something that you made and putting out into the world – it’s inherently risky. Giving form to your ideas is like exposing parts of your innermost self. Even if no one ever sees the things that you create, I feel that there is a risk in just bringing them into being. Today is the last day of my 12 week course on “creative recovery” with The Artist’s Way, and in a bit of synchronicity it will be the last of my posts on creativity for the month of March (though I’m sure it’s a topic I will return to now and again). When I started the process of reading the book and writing the journal, I was skeptical of the idea that I was a blocked artist. I thought, I am an artist, I just happen to be TOO BUSY right now to create the things I want to create. Uh huh. Much of The Artist’s Way for me was about admitting to myself that I really am afraid to make the things I want to make. 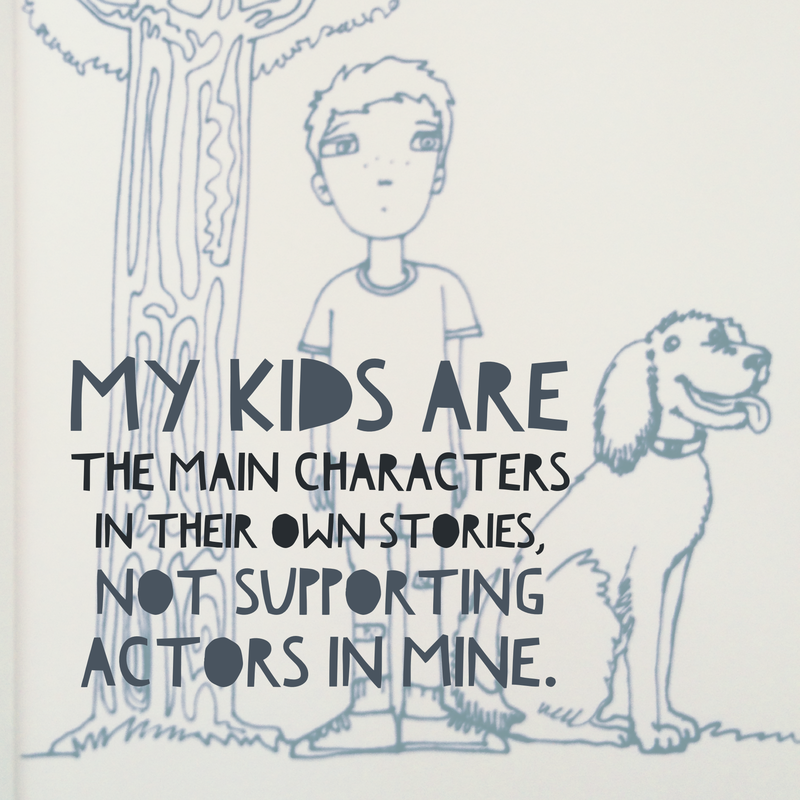 It’s much safer for me to keep them inside and just keep telling myself I don’t have time for them, yet. Sure I have time to write a couple of blogs and moderate a few Facebook pages and do commission work as an illustrator and raise and homeschool two kids and start a co-op, but write a memoir? Nawwww. Draw a comic book? If only! Though I did, through the exercises in the book, trace some of my personal insecurities back to comments that influential people have made to me along the way, ultimately I know that the buck stops with me. My fear can’t be placed at anyone else’s feet. I know that it scares me to be vulnerable and I’ve always been that way. But I am beginning to let myself set fear aside long enough to taste that excitement of doing the things I really want to do, as thrilling as letting myself anticipate a sleepover with my best friend when I was five. A lot of people talk about “failing well,” and I do love the concept. But, maybe this is just a linguistic quirk of mine, the word failure does not resonate with me a whole lot when it comes to creativity. I see failure as a binary possibility – pass/fail, success/failure. You fail a test, fail a class. It’s a kind of non-doing. You did not meet the criteria or measurement of success. You failed. What happens in the creative process seems less black and white, and definitely involves doing. Doing it badly perhaps. When you write a poem that just isn’t working, make a painting that doesn’t feel right, when your rhythm is off, when the solution isn’t coming to you, this may feel like failure. But it’s actually part of the creative process. It’s discouraging and frustrating, sure, but those clunky bits still have value. Going back to the Facebook conversation I had with my friends and family and again back to my brother’s advice – he said that he believes the more you fail, the more you learn, though it may not feel that way at the time. He used the phrase “hidden knowledge,” which I love, to describe the learning that may go on beneath the surface when you are doing something badly or feel like you are failing. My brother Ryan is younger than me but I look up to him as an artist. I don’t know anyone more hardworking and creative when it comes to following their passion (you should check out his solo work as well as the duo Kodacrome). Doing things badly is, in fact, an essential and inescapable part of the creative process. As much as I wish it were, it is not possible to be excellent the first or second or tenth time you try something. It’s a cliche, because it’s true, but think of a child learning to walk and how many times they fall as they learn. Most people are able to do some invisible work – mental problem solving, visualization, imagining – to help develop their skills, but there is always going to be some hands-on practice, and you know what they say about practice. That it makes perfect means you will spend a lot of time being imperfect first. You absolutely have to be willing to do it badly for a while if you want to do something well, or do it at all really. It’s the doing that must be your focus, not your skill level or successes. In November, I set about writing a novel for NaNoWriMo knowing that it would not be good – why? I had never written a novel before. Hell, I’d only written a handful of short stories, back in college! I had almost no practice writing fiction so there was no reason I should expect to magically be great at it. I told myself I surely had at least one bad novel in me that I’d have to get out in order to find a good one. So that’s how I moved forward. That doesn’t mean you don’t push yourself to do your best, but if you aren’t willing to make mistakes, you won’t even be able to begin. Failures will paralyze you. The pressure will stunt your growth. I’ve not read any Malcolm Gladwell yet but I know that he is famous for writing that it takes 10,000 hours of practice to achieve mastery in any skill. This intuitively sounds right, though I don’t think we should be TOO literal about the numbers. I do think of two problems with this theory. What are the two things that first come to mind, free association style, when you hear that 10,000 hours concept? Mine are Tiger Woods and piano. One problem with the 10,000 hours idea is that it makes us – or at least me – think primarily of technical skills. I don’t think of writing or drawing or singing or acting – things that, I suspect, we tend to think people are either born “good” at, or not. But in fact everyone needs to practice their skill to achieve mastery (or anything close to mastery). The other problem is that the number 10,000 is overwhelming. If you do something one hour a day, it will take you 27 years to get to 10,000. I’m not so great at math, but I think that means that if you manage to practice your skill for four hours a day, you’re still looking at almost 7 years of practice. If you are, let’s say, a busy mom unschooling two kids and working at home and just beginning to work on your passion, you might think, EGADS, I have decades ahead of me to actually become good at this! Do you know how old I’ll be time the time I learn to ______ ? The same age you will be if you don’t. 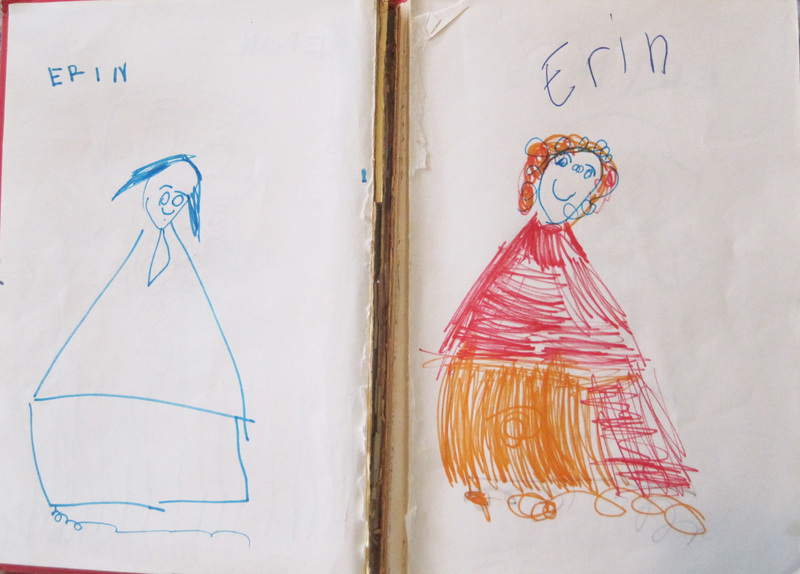 Drawings I made at age five. I believe that all people are creative. I know many disagree with that – often it’s the people who think they themselves are not creative. But creating simply means bringing something into the world that was not there before – it might be a drawing or a song, or a mathematical proof, or the execution of a football play, or just a solution to a problem. Creativity is part of being human. The idea that we are “not very creative” is a story we tell ourselves, and it is false. I do believe that everyone possesses this well of creative energy. It doesn’t mean that everyone is a genius or a master of something. It doesn’t even mean that everyone has to “do what they love” as a job. It just means that everyone is born with the ability to make something out of nothing. People themselves are works of creation, of course – a baby is a new person who never existed before. I’ve always taken a special interest in children’s drawings – not just my own or my children’s. Nearly all children begin to draw at some point in their development; it’s a preliterate form of expression that has been with our species since before we invented an alphabet. Before adults begin to interfere with the process, all children – not just the “artists” among them – have a natural sense of composition and form. Ironically, it’s when formal instruction is introduced that children tend to lose that innate sensibility, and trying to get their drawings “right” is something that cuts them off from their own creative powers. Another of my drawings from when I was five years old. Last month I was at the local art museum with Mike and the kids and we went to visit the water fountain at the same time that a school group was there drawing the fountain – I would guess they were about second or third graders. I was surreptitiously watching them draw for a few minutes, though it seemed most of them had finished their pictures by the time we arrived. The students whose drawings I loved the most had a kind of confidence and immediacy to them – some done quickly, some undertaken with more care and time, but the best ones to me all possess a sense of freedom and uninhibitedness that can’t be faked. I saw one girl, on the other hand, who had drawn a few timid lines, looked around at her neighbors, caught me watching her, and began to furiously erase her work until she literally ripped a role in the paper. Past a certain age – maybe kindergarten age? – I think there are always a few of these types of kids in any group. Sometimes they are in fact the Artists of the group who have been singled out by parents or teachers as being “good at drawing,” but sometimes they are at the other end of the ability scale, the ones who have noticed or had pointed out that their drawings don’t look as good as the other kids’. Later that day when we were in the kids’ art space at the museum, I gestured to the wall of children’s drawings, things that had been done there in the museum and pinned up, and asked Mike to guess which one I liked the best. It wasn’t the most realistic, the painstakingly “shaded” close up of a flower, the most technically advanced, the one that probably 9 out of 10 kids or adults walking by would instantly pick out as best. It was a delightful still life, done in a simple line drawing style, terrifically out of proportion, the perspective nothing close to reality, but it was alive, and made perfect sense in its own little world on the page. That drawing had the sort of energy that most adult artists try to tap back into for the rest of their lives. When I was a freshman at RISD, my first semester drawing teacher had us sit and scribble in large newsprint pads for the first 20 minutes of every class. We were not to draw anything representational or try to make it look “good,” whatever that might mean. When I was 18, frankly, that exercise was baffling and frustrating to me – I was there to make “good” drawings, why was I scribbling? – but now I totally understand it. To make something good, it must be real, and to make it real, you must let go of making it good. It’s at the heart of why early childhood drawings are so fantastic. They are not focused on making Art, they are purely making. 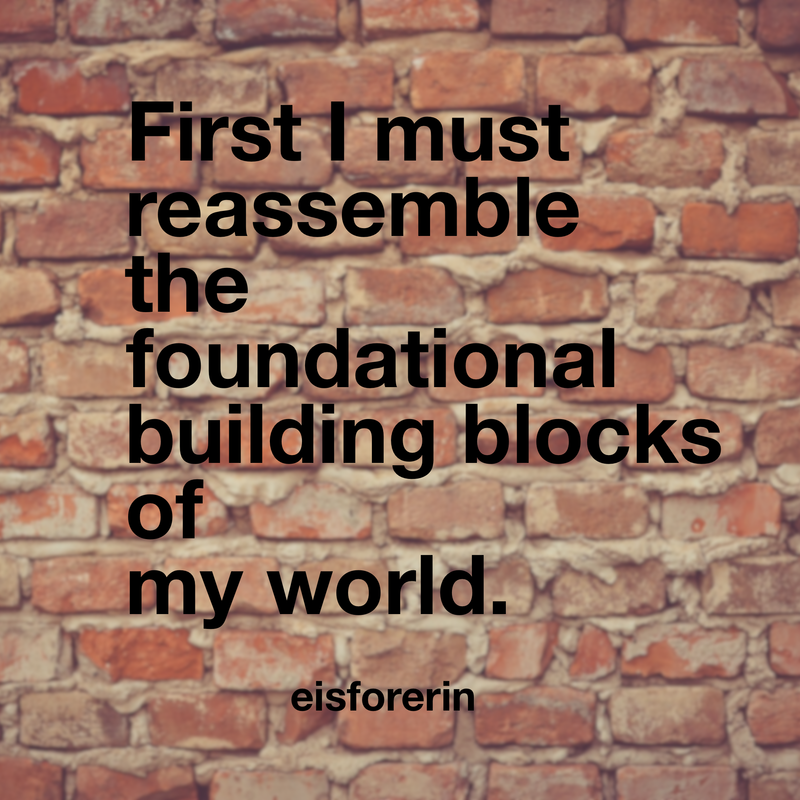 I’ve decided to write on the theme of creativity in this blog for the month of March. It’s something I’ve been thinking about quite a bit lately. Right now I am still reading and doing the 12 week course for The Artist’s Way and at the same time have also been reading Sir Ken Robinson’s The Element: How Finding Your Passion Changes Everything. There is considerable overlap between the two books so it’s been fascinating to read them simultaneously. At the heart of them is the idea that tapping into your passion – whatever form your personal expression of creativity takes – is to tap into your authentic self.